On Sunday 20th November a group of local volunteers andre-enactors teamed up to stage an ambitious swale wide event to remember the unsung volunteer heroes and an often-forgotten ambulance train service of the Great War which transported the wounded from sea landings to inland facilities. Commencing on a bitterly cold morning at Queenborough habour a dedicated group of volunteers dressed as nurses and wounded service personnel, supported by the team from Big Fish Arts re-enacted scenes of casualties being brought ashore prior to boarding an ambulance train to sittingbourne. The ambulance trains were used to transport wounded servicemen to hospitals across the UK, as far as Scotland. 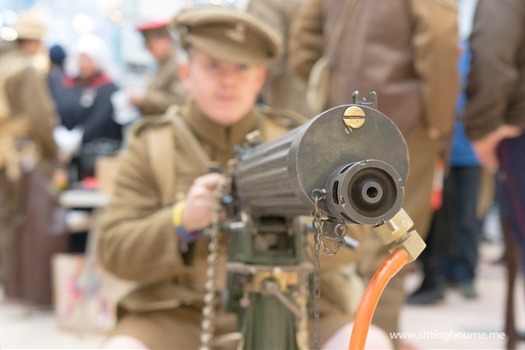 On arrival in Sittingbourne those departing from the specially commissioned High Speed Javelin Train were joined by "The Tommies of Mons" Living History Group and the Swale Marching Band who subsequently paraded their way to the Forum Shopping Centre. 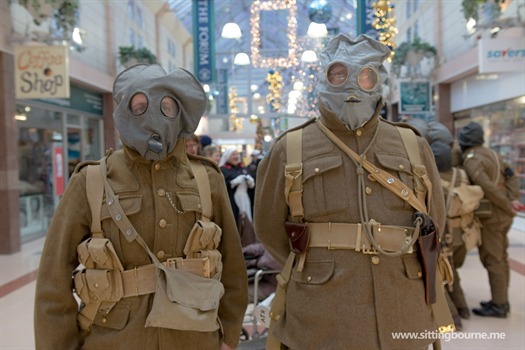 Local shoppers and visitors in The Forum shopping centre were greeted by stalls, with exhibits from Sittingbourne Heritage Museum, "The Tommies of Mons" Living History Group and rescue dog, Sikh veterans, Sittingbourne War Memorials Project, The Old Forge Wartime House in Sittingbourne with WW1 cooking advice, and make do and mend. Along with re-enactors from the Queens Own Royal West Kent Regiment Living History Group, and a Royal British Legion stand. The train then returned to Sheerness station for reminiscences at Sheerness War Memorial. Peter MacDonald explained the history of Sheerness memorial, and then Father Kevin Jacobs said a few words of remembrance and wreaths were laid, led by HM Deputy Lord Lieutenant Paul Auston Esq., who took the salute on behalf of the Queen. Alan Barber, the lone bagpiper played the lament ‘Flowers of the Forest’ to complete the day. Sue Murray, Chair of the Kent Community Rail Partnership commented: "What an extraordinary day November 20 turned out to be, and although the sun didn't shine, it gave everyone taking part - be they re-enactors or spectators - an insight into what happened when wounded sailors and soldiers were landed at Sheerness and Queenborough. The day also demonstrated the strong community links that exist on Sheppey and Sittingbourne with many groups and societies taking part. We had the bonus of the 'Poppy Train' which also brought out many spectators on the three stations to take photos of the Ambulance Train. A day to remember for many years to come." Funding and support for the event came from ACoRP (Association of Community Rail Partnerships), Swale Borough Council and Sheppey Matters. Donations on the day were gratefully received and were split between Help The Heroes, Royal British Legion and Kent Community Rail Partnership. A wonderful way to bring history to life, allowing our younger generations to understand what WW1 was about and what the consequences of WAR are!! 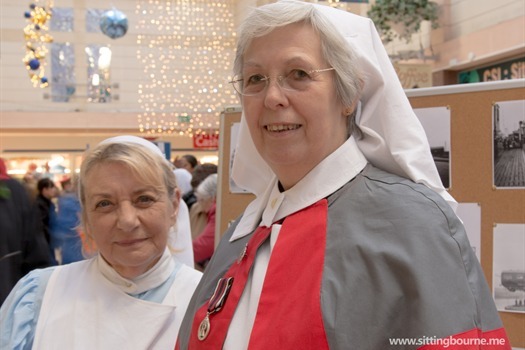 As one of the re enactors, a nurse, it was very interesting hearing the comments and trying to answer some of the questions the "wounded" had in regard to WW1 and war in general. The day itself was eye opening whilst enjoyable. Welldone to all those who organised the event and to all those who participated. It makes you also wonder how they managed during the war? it must have been *!!! !